Oatmeal Stuffed Apples - That Vegan Dude! This is super easy to put together, takes some pretty minimal effort but can come across looking like you spent a lot of time with it. The oatmeal needs to soak overnight (ideally, not necessarily) and other than that there’s just some baking time involved. Enjoy friends! The morning after bring the soaked oats plus liquid with the extra cup of water, ginger, cinnamon, brown sugar, salt, and vanilla to a slight boil over medium heat. Preheat oven to 375º F.
While this is heating up trim the top of the apples off, carefully cut out the 'guts' of the apple. I find it easier to make a few cross cuts then go around the perimeter and try not to get too close to the skin. It also helps if you cut the bottom out! You can finely chop up the pieces of edible apple and throw them in the cooking oatmeal at this point. Once the oats have cooked for a few minutes spoon out a couple full tablespoons into the apples. Place the stuffed apples into the oven and bake for 15 minutes (longer if a softer apple is desired). 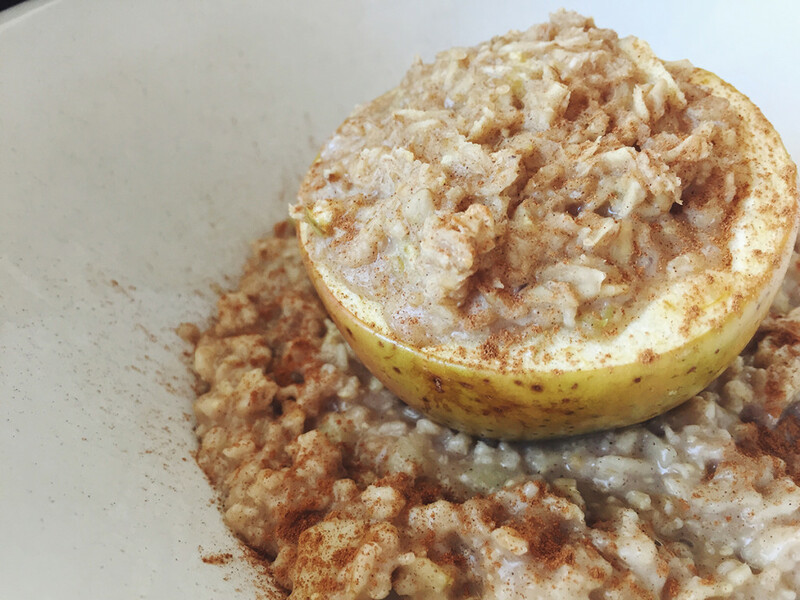 Remove from oven, spoon out the leftover oatmeal into a bowl/plate and place the baked apple atop. Garnish with a sprinkling of cinnamon.